34 illegal buildings located on Jl. G Raya, Kelurahan Karang Anyar, Sawah Besar, Central Jakarta are controlled.
" Building control can be carried out well"
Sawah Besar Sub-district Head, Martua Sitorus said, building controlling is done according to procedure from socialization until issuance of Warning Letter (SP) 1, 2, and 3. "Building control can be carried out well because buildings which occupy this social and public facilities land are no longer used," he stated, Wednesday (9/5). After controlling, his side will return the land to its original function which is used as road access to Karang Anyar Flat. "In order to renovate flat, this road access needs to be widened because heavy equipment will pass the road," he added. 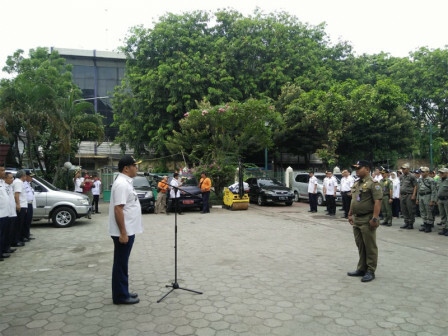 Central Jakarta Satpol PP Head, Rahmat Lubis said, this controlling involves 150 joint personnel from Satpol PP, PPSU, Water Resources Sub-dept., Forestry Sub-dept., Environment Sub-dept., Bina Marga Sub-dept., Police, and TNI. "We also deploy three heavy equipment to accelerate dismantling process. Hopefully it could be finished today," he conveyed.